Malina, Bruce J., and John J. Pilch. 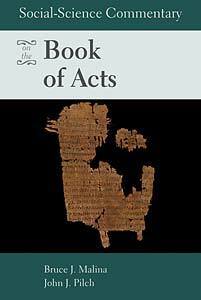 Social-Science Commentary on the Book of Acts. Minneapolis: Fortress 2008. Like earlier volumes in the Social Science Commentary series, this volume situates Acts squarely in the cultural matrix of the first century Mediterranean world, elaborating its codes of patron and client, mediatorship, honor and shame, healing and sickening, wizardry and witchcraft accusations, and the understanding of the Spirit of God as well as deities and demons as personal causes of significant events. Make sure you check out the Google Books preview here. Thanks to Fortress Press for the review copy. Thanks for mentioning this book and the larger series of social-science commentaries from Fortress. I was not aware of the series but after reading your post ordered the Revelation volume. So far I'm very happy with it. Peace. Glad it was helpful Milton.